WARNING: This website and links to other sources, contain images, names, or voices, of deceased people in text, etchings, photographs, film, audio recordings, news media, paintings and printed material. Although there are some memorials to conflicts that took place on the Australian frontier and to the people who were involved in them, the majority of the people who took part and the places where confrontations, killings and massacres took place, are not recognised. Compared to the many war memorials across the country, dedicated to the fallen in wars in which Australians have participated overseas, the lack of memorials to frontier conflict is a very sad indictment of the level of knowledge, understanding and compassion of governments and Australians generally about, and for, the people who gave their lives on the Australian colonial frontier. While memorials are often statues or monuments, they can come in many different forms such as books, films, gardens, graves, paintings, plaques, poetry, song or sites. 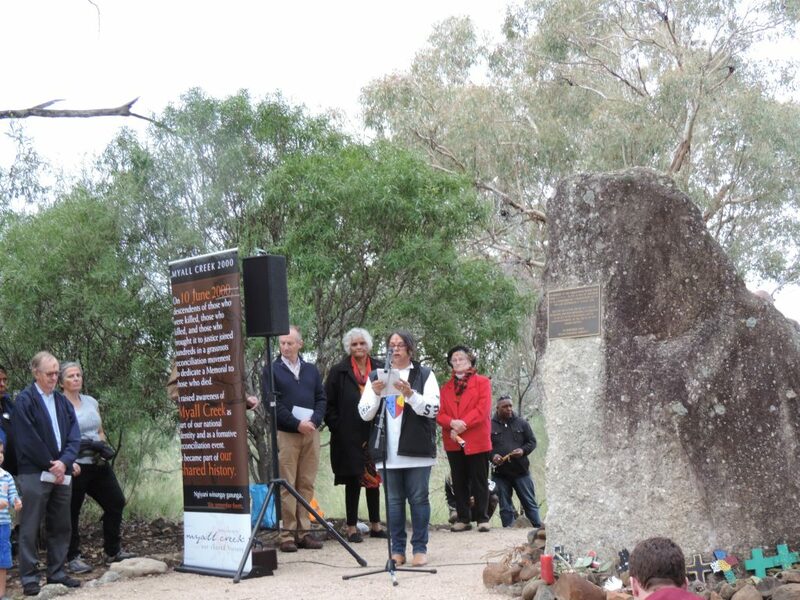 Some memorials commemorate Aboriginal peoples who inhabited certain places before the arrival of colonists in 1788, but do not honour those who gave their lives in the defence of homelands from 1788 onwards. Examples of types of memorials follow. Forest Refuge: A memorial to Aboriginal people who gave their lives in frontier conflicts around Buderim, Queensland is located in the Buderim Forest Nature Refuge. Links to information about this memorial can be found below under Queensland listings. 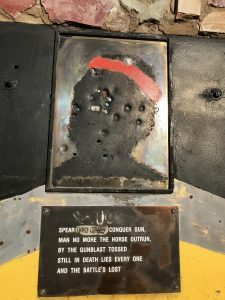 In Fremantle, Western Australia, back in 1994, Aboriginal people did not vandalise a highly offensive statue, but added a counter-memorial to it (see Counter-memorial, Fremantle under Western Australia below). While he has decried the vandalism of the Cook statue in Sydney, renowned journalist Stan Grant, among others, has also weighed into the argument, calling for the history of Cook to be corrected: ‘Correct Captain Cook history says Stan Grant’, NITV 22 August 2017. Read more at: https://www.sbs.com.au/nitv/nitv-news/article/2017/08/22/correct-captain-cook-history-says-stan-grant. The controversy surrounding the truth of Australia’s history and honouring explorers and colonists was about to become even bigger with the announcement in the Federal Budget, handed down on 8 May 2018, of $48.7 million over four years for the commemoration of the 250th anniversary of Cook’s first voyage to Australia. Concerned Australians and those living in difficult circumstances, like many in Aboriginal and Torres Strait Islander communities, might ask why do we need to spend so much honouring a man whose actions were partly responsible for the later dispossession of possibly 1 million or more First Peoples? Could these funds be better spent on other programs such as support for programs initiated and run by Aboriginal and Torres Strait Islander peoples themselves? Most of the funds allocated were to be spent in 2017–18, including a $25 million Australian Government contribution to the government of New South Wales for the Kamay Botany Bay National Park 250th anniversary project in Sydney. On 28 April 2018, in the lead up to the Federal Budget, the then Turnbull government announced that $50 million was to be spent on the redevelopment of Botany Bay, the first landing place of the British First Fleet in January 1788 that heralded the arrival of colonists. Read more in Nick Sas’s story, updated on 29 April 2018: ‘Botany Bay site’s $50 million redevelopment, including James Cook statue, set to transform historic site’ at: https://www.abc.net.au/news/2018-04-28/prime-minister-reveals-revamped-memorial-for-port-botany/9707338. 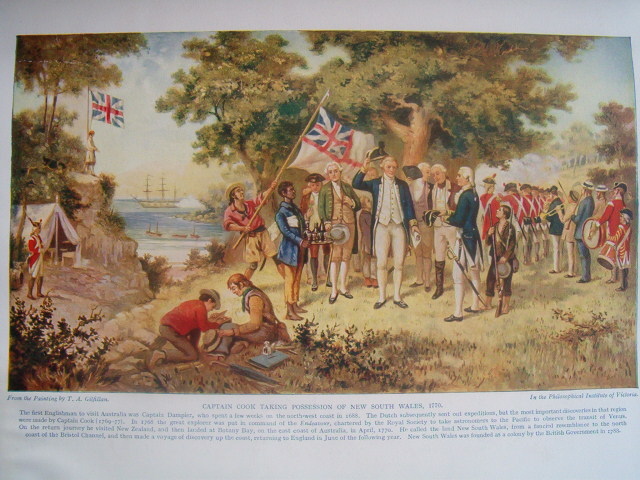 The development is to include a new ‘aquatic monument’ honouring Cook, the English explorer who ‘took possession’, without the consent of the original inhabitants, of the east coast of Australia at Bedanug or Bedhand Lag (Possession Island) on 22 August 1770. Researcher Graeme Taylor has delved into the history of what actually happened at Bedanug Island that day. In his article, ‘Stirring the Pot of the Dead Cook’, at: https://nationalunitygovernment.org/content/stirring-pot-dead-cook, Taylor finds a number of problems with the ‘official’ histories of Cook’s ‘possession’. This event does raise questions about the legitimacy and legality of the existence of ‘Australia’ the nation state. 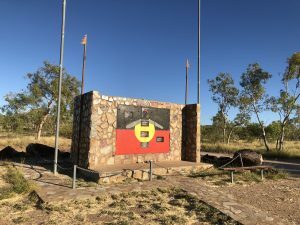 Below are links to websites relating to memorials throughout Australian States and Territories, to some known conflicts between colonists and Australia’s First Peoples. This list, that was first created in 2015, is being expanded as more information becomes available. Please let us know about any memorials or monuments, already existing or proposed, that are not included in the list below. Please also let us know of any broken links through our online email Contact page. Memorial to those who died around Cocanarup in the early years of colonisation. First compiled by Jane Morrison July–August 2015, updated 25 July 2016, 24 October 2016, 7 November 2017, February 2018, May 2018, March 2019.